The First Crossing Day Use Area is a 16 acre day use site located off Paradise Road just before the first Santa Ynez River crossing ford. 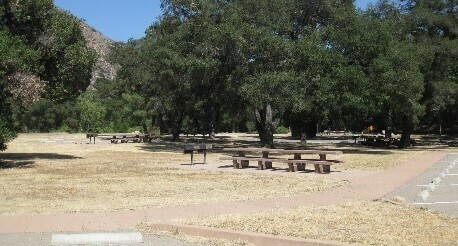 The facility has 50 picnic tables at 13 picnic sites accommodating 16 to 24 people each. The site consists of 130 parking spaces with one trailer parking space. There are three vault toilet buildings each with two seats for a total of six seats. The interior roads and parking spurs are paved, all walkways are concrete and the entire site is accessible. The site is designed for large extended family groups. There are three large garbage dumpsters located throughout the site. There is no electricity or phone service to the site. First Crossing Day Use Area is open all year. During high river flows Paradise Road is closed to motorized vehicles at the river ford and this facility becomes the “end of the road” for visitor vehicle access.